Today we are elated to release to you our new track “Eternally Yours.” We are incredibly proud of this song, much like our previous single “570,” we feel it embodies the heart and soul of Motionless In White. Demonstrating many aspects of the evolution of the band thus far, while standing firm on the foundation we have built with our preceding records. It is collectively one of our favorite tracks of the bands entire discography. While having previously planned to release our forthcoming album, Graveyard Shift, in the winter of 2017, we are also very happy to announce that after much discussion and planning with our new label home, Roadrunner Records, May 5th 2017 will be the moment we finally get to unveil to you what we have worked so hard on throughout all of 2016. Knowing how much passion and care has gone into the creation of this album, we can assure you that it will be worth the wait. Until then, please enjoy "Eternally Yours" and all of what’s to come along the way to May 5th. 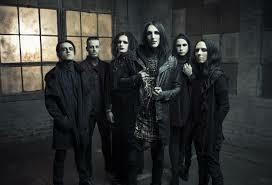 We can definitely say that the new MIW will be one of the most anticipated albums of the year. Yours truly will be seeing them and reporting live at In Fest Milano, on June 14th.